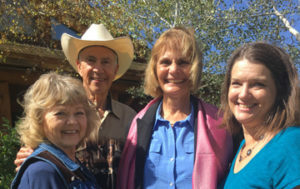 New York Times bestselling author Anne Hillerman spent two days at Sylvan Dale Ranch during her September 18-19 visit to Colorado as the “Loveland Loves to Read” author of the year. Hillerman spoke to a sold-out crowd at the Rialto Theater on Monday night, and to another sold-out lunch at the Ranch on Tuesday. She is the daughter of Tony Hillerman, author of 18 mysteries set on the Navaho reservation in New Mexico. Her first novel, Spider Woman’s Daughter, includes characters Jim Chee and Joe Leaphorn that her father created, while moving a female Navaho police officer, Bernadette Manuelito, onto center stage. The book was enthusiastically received by the Loveland Community. It received the prestigious Spur Award from Western Writers of America in 2014.